Razer Green Switch: features a tactile bump and distinctive click sound along with optimized actuation and reset points for best in class gaming and typing performance. Razer Orange Switch: features a tactile bump and feedback without the audible click. Offers the same optimized performance with less actuation force as a Razer Green Switch, while maintaining a quiet gaming experience. 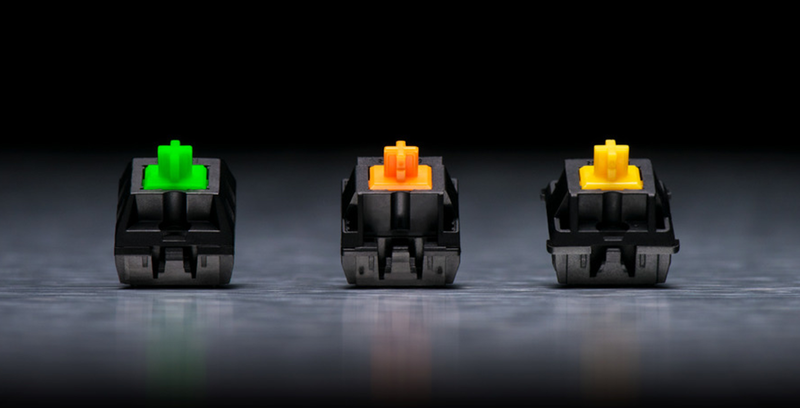 Razer Yellow Switch: features an ultra-fast actuation of only 1.2mm and quiet performance for rapid-fire keypresses and lightning-paced gaming.